The figure tells it all. Turnover in Indonesia's food and beverage sector reached IDR400 trillion (approx. USD30.3 billion) in Q1-2016, higher by 7.55% from the same period in 2015. Moreover, inside the growing F&B Industry in Indonesia, lies another opportunity in cafe & brasserie sector that where only within five years from 2008-2013, the industry has experienced a 10% growth in terms of cafe outlets and revenue. It is also expected that for the next five years on 2013-2018, the total revenue may grow by USD3.4 billion reaching USD4.16 billion with 3.42 CAGR. Answering the above trend, industry players, professionals, business owners are seeking for new, improved ways to develop their business in cafe & brasserie sector as the trend is showing an increase and huge opportunities. Cafe Brasserie Indonesia (CBI) will be tapping into this growth of cafes and social culture of Indonesian urban people nowadays that loved to mingle, seat and chat and drink coffee, which all are driven by an increasingly consumerist habit. It is our vision to create a unique event under one roof as "one stop business solution" where 200 exhibitors will show their latest innovation in delivering the best experience for 20,000 owners, investors, professionals, and consumers. CBI considers the "push" factor for development that matters for industry players where they can meet, greet, and expand business network with other players in Cafe Owners Club and Cafe Business Forum. Moreover, there will be workshops and seminars to gain in-depth information and more marketing insights, directly from the big names and key decision makers in the industry. In addition, CBI also implements the "pull" factor that derived from consumers as cafe & brasserie is closely related to the community. CBI will feature the Culinary Competition, Barista Championship, Golden Leaf Tea Competition, and many others for professionals to showcase their skills and entertained the visitors in experiencing live demonstration of wonderful dishes, coffee, tea and desserts. The Cafe & Brasserie Indonesia 2016 will be held alongside Franchise & License Expo Indonesia (FLEI) by PT Reed Panorama Exhibition (RPE) on 2-4 September 2016 at Jakarta Convention Center (JCC) Senayan. During this three days of exhibition, both local and international producers and suppliers in Bakery & Pastry, Food Ingredients, Coffee/Tea Brands/Producers/Distributors/Suppliers, Interior Design, etc can showcase their expertise to attract, business owners, professional, and top management in cafe & brasserie sector. The show is supported by Ministry of Trade of Republic of Indonesia, Indonesian Specialty Coffee Association, Association of Food and Beverage Company in Indonesia (GAPMMI), Association of Indonesian Coffee Exporters and Industries (AICE), Indonesia Tea Board, Association of Indonesian Coffee Luwak (AKLI), Indonesian Hotel and Restaurant Association (IHRA). 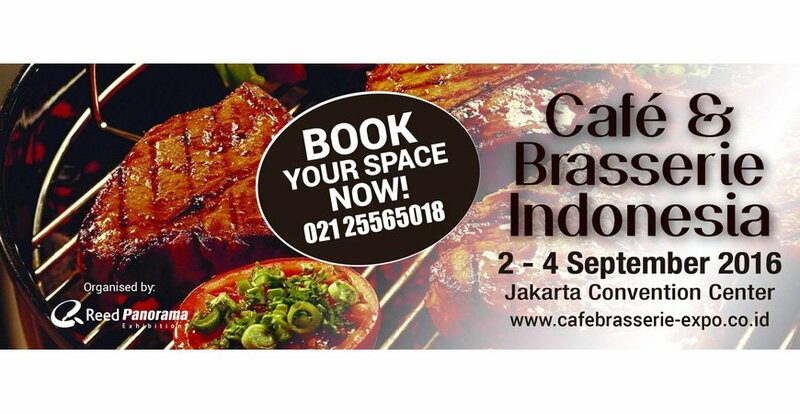 Café & Brasserie Indonesia (CBI) Expo is the Gateway to the Growing Indonesia Café & Brasserie Sector. This is the place to raise your company profile and to close in on the deals.